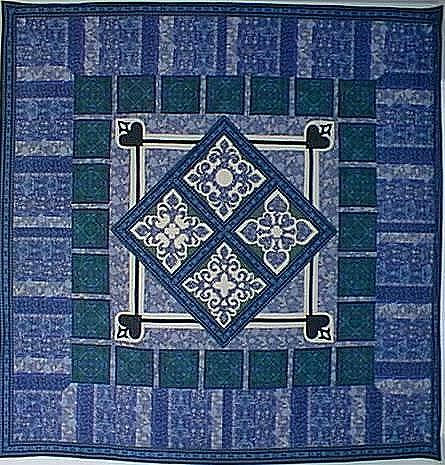 This quilt gallery contains images and descriptions of some of my latest and my most favorite quilts. Click on the thumbnails for larger size images. When finished looking at the larger pictures click on your browser's Back button to return to the gallery page. 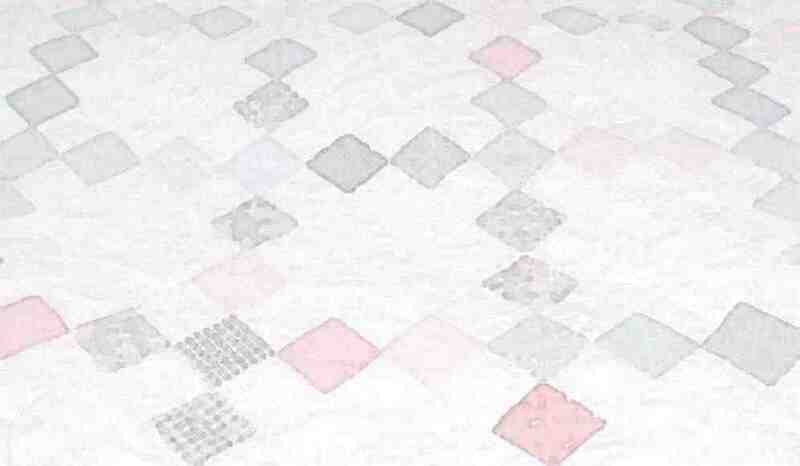 Some of the quilts have links to the corresponding patterns. I hope you enjoy the show! 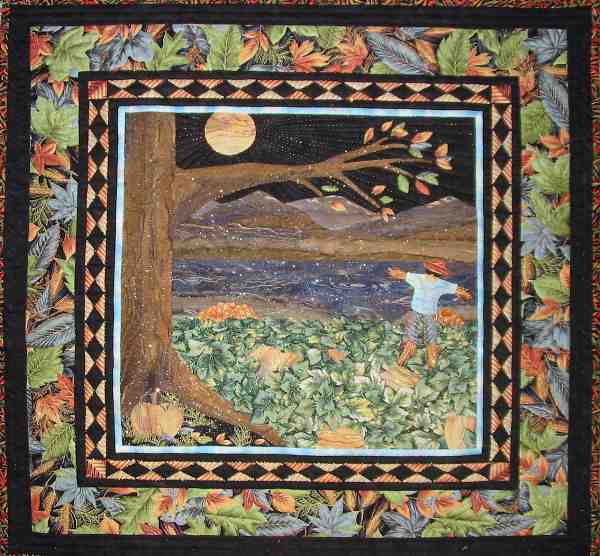 Dimensions: Wallhanging - 30" x 30"
This quilt was my entry in the Keepsake Quilting Challenge - Autumn 2002. The quilt is completely hand appliqued and hand quilted. The quilting is done using Sulky Sliver Metallic threads which gives it that sparkle. To enter, you simply purchase a challenge pack of six fat quarters of pre-selected fabrics, and you can choose to add up to two other fabrics. You can order additional fabric as well. The quilt must be 30" x 30". My inspiration came from the Lakes Region and the wonderful batik in the pack which I could not help seeing beautiful landscapes in it. I highly recommend the experience. Making the most of what you are given to work with is an excellent exercise in quilting and in life. They run several challenges a year. Check it out in the catalogue or on the web. 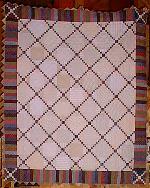 Dimensions: Shawl or Wallhanging - 24" x 64"
This quilt is for a very dear friend who is turning 40! You know who you are! As an old lady I thought a shawl was appropriate. This piece was hand appliqued and machine quilted. I used Quilters Dream Cotton Select, which is rapidly becoming my favorite batting. The fabrics are all batiks. The inspiration came from a trip from Pheonix to SanteFe we shared, and of course the beautiful deserts. Dimensions: Large Lap - 65" x 77"
This quilt is for my mother who is looking forward to retirement. Made entirely from scraps on hand, most left over from the "My Story" quilt, this quilt has a charming antique feel about it. The shirtings really give it the old fashion look. The quilt contains over four hundred tiny four patches. The borders and back are pieced as well. There are prairie points around the edge. The quilt is machine pieced and machine quilted. 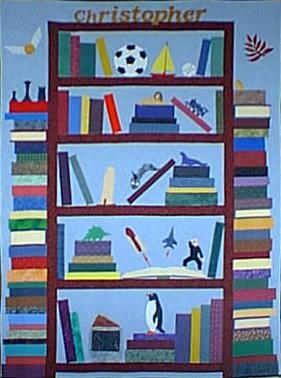 This quilt was completed in April 2002. There are 2392 pieces in this quilt which is if one piece was added each week then the quilt would have required 46 years to complete. I used the Quilter's Dream Cotton for the first time and it was wonderful to work with and resulted in a lighter weight quilt perfect for warmer weather and climates. Enjoy Mom, I love you! 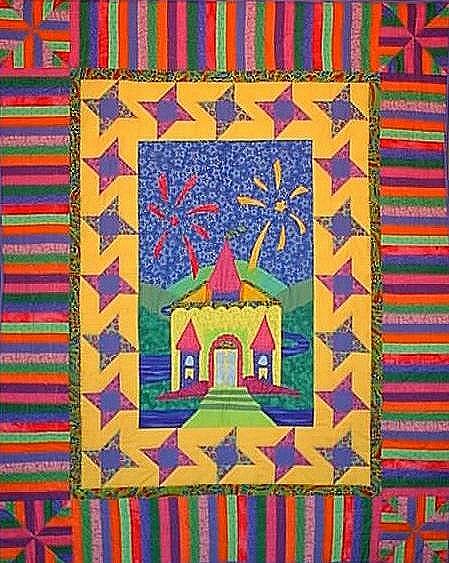 Pattern: Medallion Quilt - "My Story"
Dimensions: Queen - 92" x 92"
This quilt is about our new log home in the mountains. Each section of it relates to some aspect of the location. The blocks from the center out are: log cabin, filtered view of the lake through the pine trees, flying geese, deer and moose tracks, my expanded version of delectable mountains, and finally bear paws. 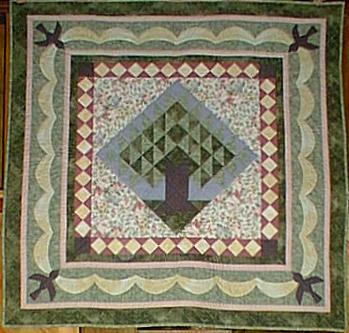 The quilt is machine pieced, with the four seasons cornerstone blocks hand appliqued. Several of the blocks used are my versions of traditional blocks. The quilt was then machine quilted. 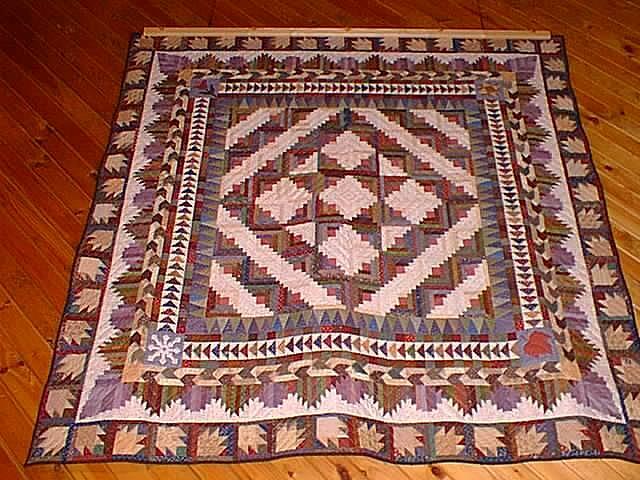 This quilt was started in July 2001 and completed early December 2001. 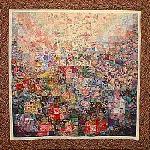 There are 4290 pieces in this quilt. It is one of my most favorites. Pattern: Landscape - "Arizona Sunset"
Dimensions: Wallhanging - 8" x 10"
This tiny quilt top was hand appliqued and matted to create the Arizonia sunset. Inspired by a trip to Arizona, and a quilt class with Jo Diggs that I attended. She's great if you can catch a class with her. Dimensions: Lap Size - 53.5" x 53.5"
This is a collection of my first Baltimore Album papercut blocks. The blocks and borders were done with hand appliqué. The quilt was then machine pieced, and machine quilted. I have studied with Faye Labanaris and Elly Sienkiewicz. I highly recommend both their books and classes. Pattern: Contemporary Pieced - "Dye Fusion"
This quilt has over 2300 pieces, and is almost entirely made out of batik scraps that I purchased for $1.00. There is a repeating block. Each block has two color fabrics used in it. The arrangements of blocks gives the impression of pools of colors bursting next to each other. 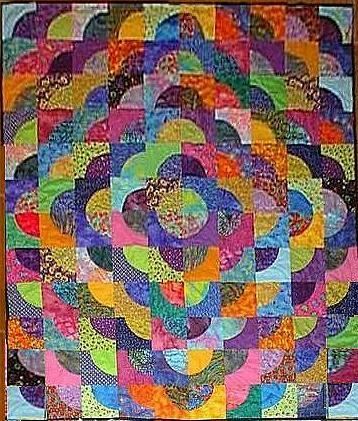 This quilt is machine pieced, and hand-quilted in spirals. This is another one of my absolute favorites. 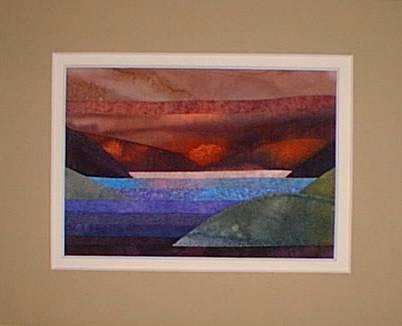 This quilt was shown in the Images Quilt Show several years ago. 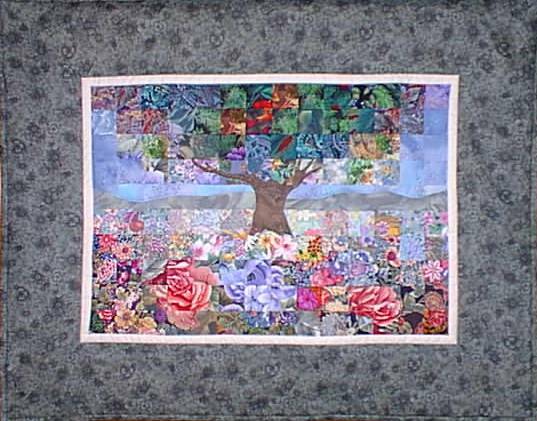 Pattern: Watercolor Landscape - "Shade Tree"
Dimensions: Wallhanging - 24.5" x 31.25"
This quilt was made using a combination of watercolor quilting and hand appliqué. The watercolor background was machine pieced, then accents were hand appliquéd, and finally the quilt was machine quilted. This is a favorite of mine. I imagine myself walking out in that field of flowers and sitting under that wonderful shade tree, staring at the mountains in the distance. Pattern: Crazy Quilt - "Tenth Anniversary"
Dimensions: Queen Size - 90" x 108"
This quilt was a gift to my husband on the occasion of our tenth wedding anniversary. There are 120 blocks each containing at least one photo, and a special memory. Some husbands bring their wives flowers, well for several years while working around the corner from a quilt shop my husband would bring me a fat quarter of fabric. Many of those gifts were used in making this quilt. If you haven't guessed he likes the bright colors and prints. Using black thread and all those decorative stitches on my sewing machine I top stitched the seams. The photo transfers, and foundation fabric made it necessary to tie this quilt due to it's bulk. This was a wonderful project. Thanks to my quilt buddy Tammy who introduced me to crazy quilting, and encouraged me to "Go for it, and let it happen". She even helped me tie the quilt so it would be ready on time. This quilt was inspired by nature. Every Spring I get a strong desire to make a bright warm quilt to reassure myself the long winter is nearing its end, and Spring is just around the corner. The quilt was machine pieced and hand appliqued. 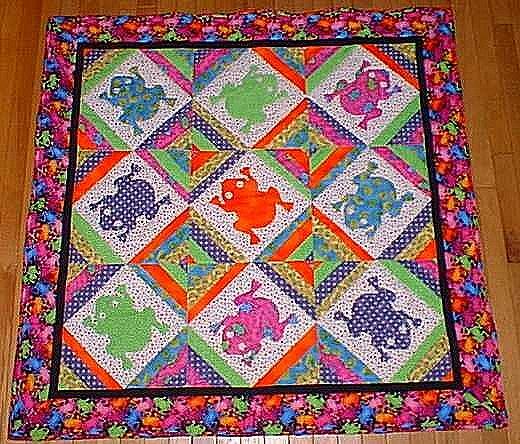 It was finished with machine quilting. 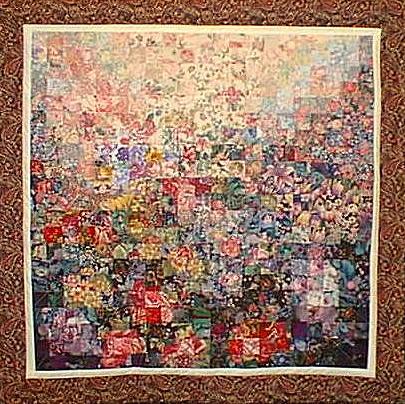 The quilt is approximately sixty inches so it can be a large wallhanging or a small throw. 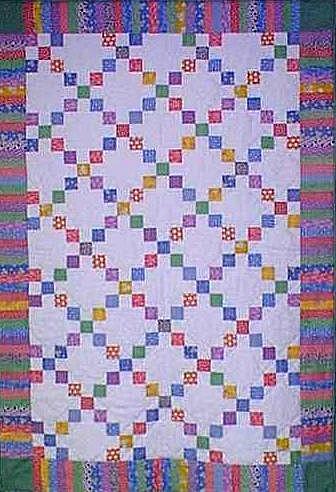 I have included a pattern for this quilt on my Quilt Patterns page. This quilt was designed by an eight year old boy. It took me two years to complete. This young man loves to read, so the main focus is his love of books. He filled his shelves with the main characters from his favorite stories and symbols of his many other interests. Truly a labor of love and one that he enjoys curling up under on many a cold night. This quilt is completely hand appliqued and machine quilted. Dimensions: Baby Quilt - 36" x 36"
The 1930's reproduction fabrics makes this a great baby quilt. 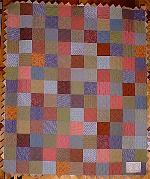 With more blocks it could be easily expanded into a lovely bed size quilt. The blocks are hand appliqued, and machine quilted. I completed it in about one week. By using a less traditional layout, and some fast and fun machine quilting, this quilt is a breeze to make. 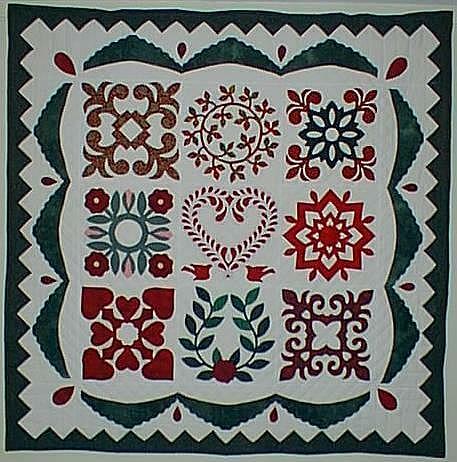 I have included a pattern for this quilt on my Quilt Patterns page. 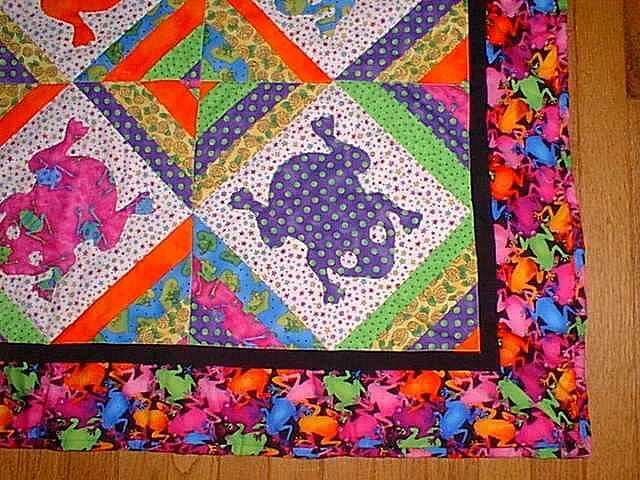 Pattern: Contemporary - "Frog Pond"
Dimensions: Baby Quilt - 40" x 40"
This quilt was a gift to a new baby of some close friends of mine. The neighborhood children loved playing around the frog pond found behind their home. When I heard a new baby was on the way, I knew exactly what I had to do. Not all neighbors are friends, and I considered myself very lucky that these folks were both. This quilt was machine pieced and hand quilted. 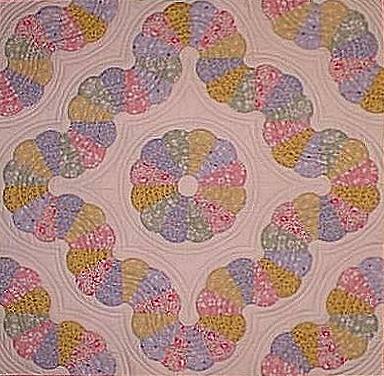 Done in pastels, this quilt is perfect gift for a new baby. The circular piecing was manageable, but I would not recommend this project for beginners. Dimensions: Wallhanging - 38" x 38.5"
This was one of my first attempt at a watercolor quilt. This quilt was machine pieced and machine quilted. I really enjoy the process involved with making watercolor quilts. It's an excuse to collect lots of fabrics, and it truly brings out the artist in me. It is very much like painting with fabric. Dimensions: Wallhanging - 27.5" x 27.5"
This was my first attempt at a miniature quilt. With over 500 pieces it is technically not a miniature quilt. This quilt was machine pieced and hand quilted. 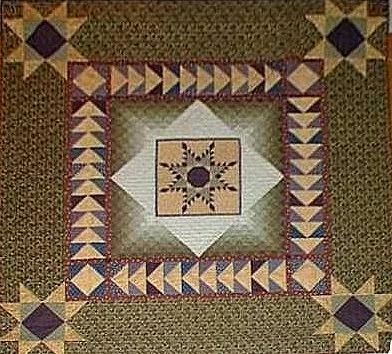 I hand drafted this pattern for the center compass and surrounding feathered star. Dimensions: Lap Size - 27.5" x 27.5"
This quilt was inspired by a very special little girl's drawings and imagination. There is a castle surrounded with a moat, flowers, spires, and a meandering stream. The night sky is lit up with fireworks every night in her kingdom. Dimensions: Lap Size - 47.5" x 70.5"
This quilt was done for someone living in the southwest. I used autumn colored mottled solid prints which reminded me of the warmth and colors of the desert. Framed in black, the quilt is very striking. I appliqued an autumn colored circle onto a black square and then sliced the square into quarters, resulting in four drunkard's path blocks. If you carefully cut the black background away from behind the circles you have a nice set of black circles for another project. This quilt was machine quilted. 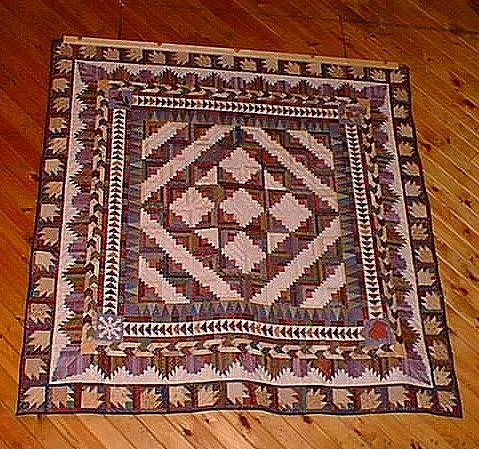 Pattern: Snail's Trail - "New England Trail"
Dimensions: Lap Size - 65" x 65"
This quilt is a traditional Snail's Trail pattern using only plaids in New England colors. This quilt was machine pieced, and machine quilted. I really love the effect of using plaids with the Snail's Trail blocks as it adds extra movement. 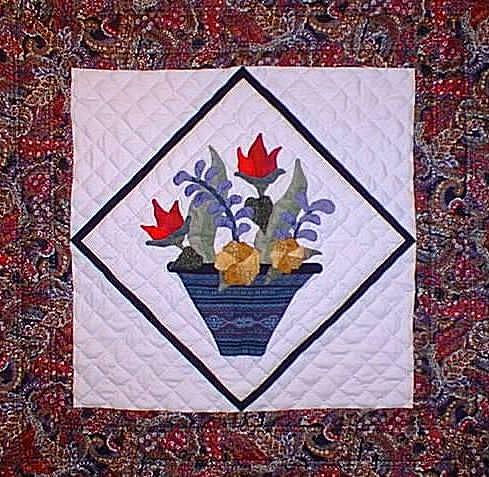 Pattern: Hand Applique - "Flower Pot"
Dimensions: Wallhanging - 26" x 26"
This quilt is my own design. It was hand appliqued and hand quilted. I used a border fabric for the pot to add interest to design. Setting the block on point adds visual interest as well. 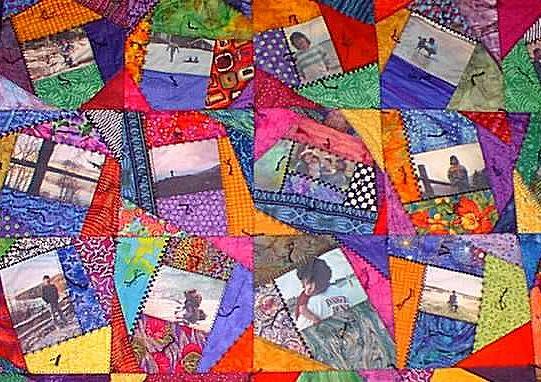 This quilt was made using lots of batiks and contemporary bright prints. The young lady this quilt was made for wanted a quilt with lots of bright contemporary colors. 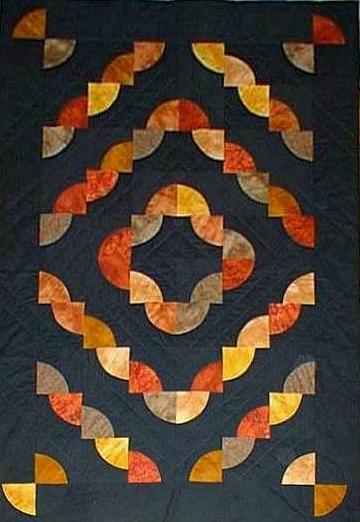 I hand appliqued large circles onto the center of square blocks, with half being light centered, and half being dark centered. I then sliced the circles into quarters giving me four drunkard's path blocks for each circle. By carefully trimming the background behind the circles I a nice collection of circles left over. 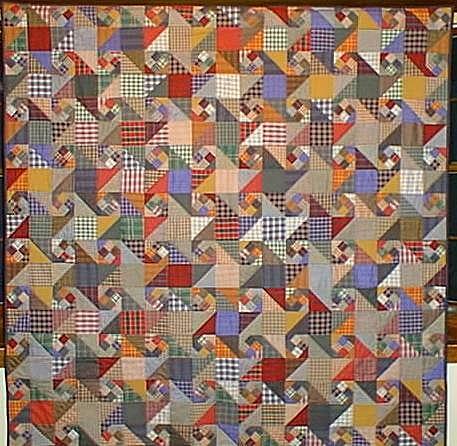 This quilt was made with 1930's reproduction fabrics, and was machine pieced, and machine quilted. I didn't warm up to the 1930's reproduction fabrics right away. But, there is nothing more charming at the end of a long winter than to treat yourself to the fun bright colors and patterns. It makes Spring feel a bit closer. For the background fabric I used a white on white printed muslin for an added subtle texture. 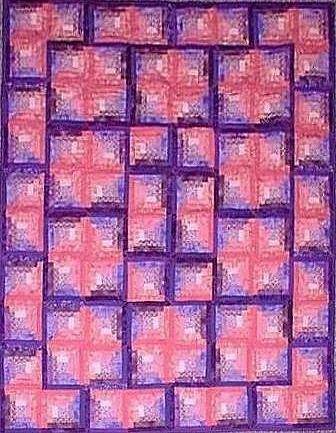 This quilt was made for a little girl with a passion for pinks and purples. I grouped four log cabin blocks together to form larger blocks. 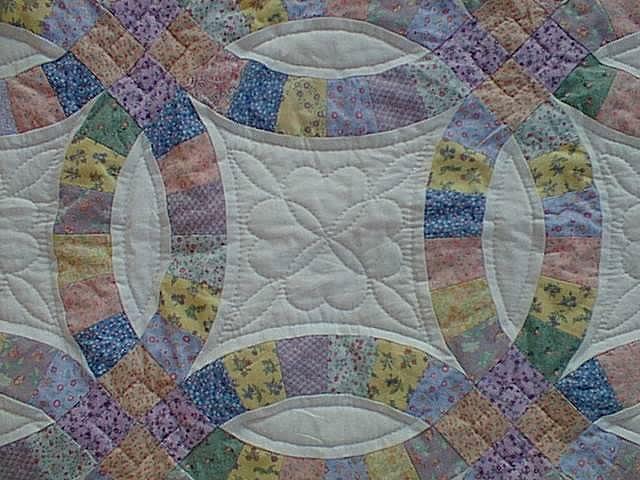 There are two large blocks with purple centers in the center of the quilt. I surrounded them by seven pink centered larger blocks. The outside border forms a nice zig zag edging effect. 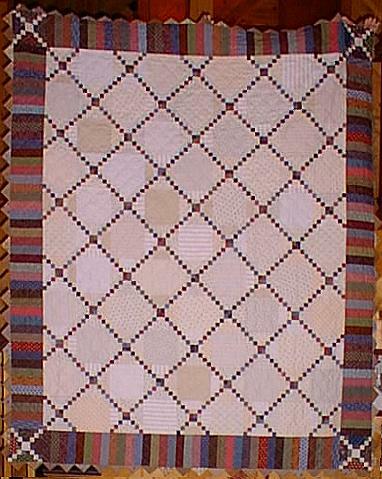 Using this setting and colors the traditional log cabin blocks create a contemporary quilt with some pizzazz. 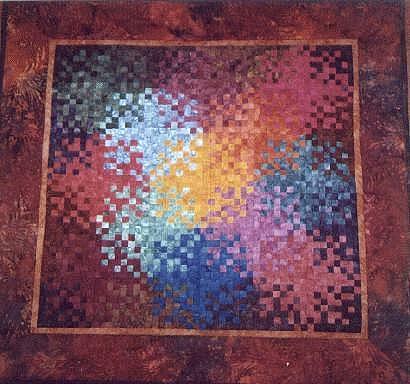 Dimensions: Queen Size - 88" x 88"
This is quilt is my own design. At the time of it's making I was enjoying Baltimore Album hand applique and soft edge piecing which was introduced by Jenny Beyer. I designed the quilt around the Jenny Beyer border print fabric. 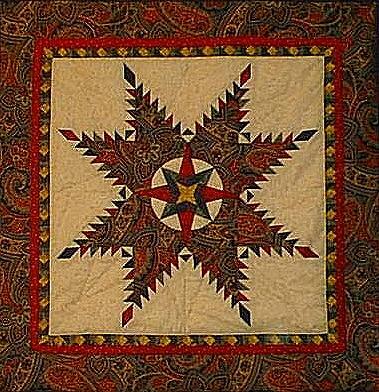 The quilt was constructed using hand applique, machine piecing, and machine quilting. This is a challenge quilt, done after a trip to a fabric store. After selecting a couple of fabrics, my quilt buddy and I challenged each other to make the most of them. The quilt is machine pieced, and machine quilted. I really like the setting triangles, which add a second subtle starburst effect. The setting triangles are made from cutting up a larger pieced rectangle. Very simple to do once you figure out the trick. The feather star is from a book, one of the few times I successfully followed someone else's instructions, and I cannot find it again. ARGH!